Have you ever entered a store and been completing overwhelmed by thousands of choices? Beauty counters, specialty stores, etc. Countless bottles in a myriad of colors, shapes, and sizes lined across hundreds of shelves; all of which initially seem the same but are supposedly differently? We have more options than ever before. Colors and brands are prominently displayed but ingredient lists are in tiny, micro-sized fonts. The lists are in English but some times in foreign languages. But really, even in English, do you know what polybutylene terephthalate or toluene are? (Ingredients commonly found in eye shadow and nail polish) Do you know if they're safe? Nope - let me google that. Consumers are increasingly more conscientious about what they put in their bodies (healthy eating) and training their bodies (exercising regularly). However, we often forget to consider what we put ON our bodies: make-up, sunscreen, soap, etc. - prioritizing effectiveness over anything else. While there are varying arguments on the impact of topical products on internal wellness, let's not forget that skin is the largest organ of the body. It is complex and requires care and vigilance. Thankfully, a company here in Boston has been asking questions AND sourcing solutions since 2013. 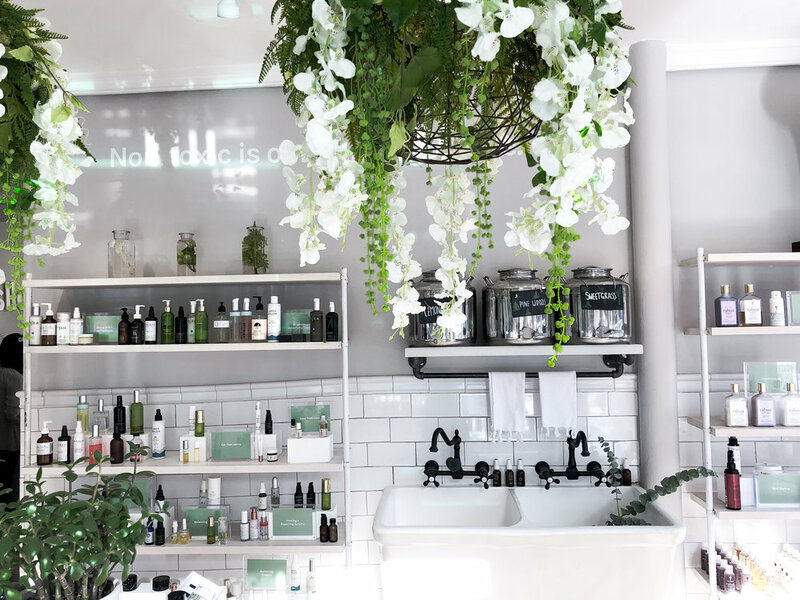 Follain curates clean and healthy beauty products in their stores and online. According to their website, they assess their products and have a restricted ingredients list. I recently visited Follain's original location in the South End. The store is small but light, bright, and quietly organic. I am immediately drawn to the hanging decor: three dark wicker orbs adorned with faux orchids, fern leaves, fauna, and other greens. Hilary the store director informs me that they just updated those for spring. They're beautiful. A large double farmhouse sink with black hardware also sticks out. It's an invitation for patrons to try out their natural hand soaps (with refillable bottles!). Their other products sit on a handful of glass and wooden shelves. Across their largest wall is the motto: "Non-toxic is our non-negotiable". Shopping at Follain (at both locations) was both enjoyable and a learning experience. In the South End, Hilary was friendly and welcoming. She chatted with me about the history of Follain, how the products were organized, and her personal experiences of what worked for her. I was able to test products for the texture and consistency. I was the only client in the store for most of my visit so I took my time taking in the scents and reading product labels. I never felt pressure to buy anything. I specifically was interested in the natural deodorants (do you know the difference between anti-perspirants vs. deodorants? If not, read here). I previously purchased AER Next-Level from Follain's Beacon Hill location which ultimately did not work for me. This deodorant truly smelled incredible (ginger grapefruit) and applied smoothly but it only lasted about 3-4 hours. I need a product to do at least double that amount of time as I never carry deodorant with me. Plus for the price, it is a requirement to repurchase. Hilary recommended PiperWai in the non-stick form. I was hesitant as sticking my finger in a pot of product can cause contamination. But Hilary swore that the pot-form was better than the stick version so I decided to be brave and buy it. At checkout, I also grabbed a French Girl lip scrub for my dry, wintery lips. Follain is one of those stores that is a joy to be in. It is a reprieve from the city bustle, and most importantly has a selection of uncommon products. I'm looking forward to trying more natural and non-toxic products here. Follain has two locations in Boston. One located at 53 Darmouth Street in the South End (pictured here) and the other at 65 Charles Street in Beacon Hill.